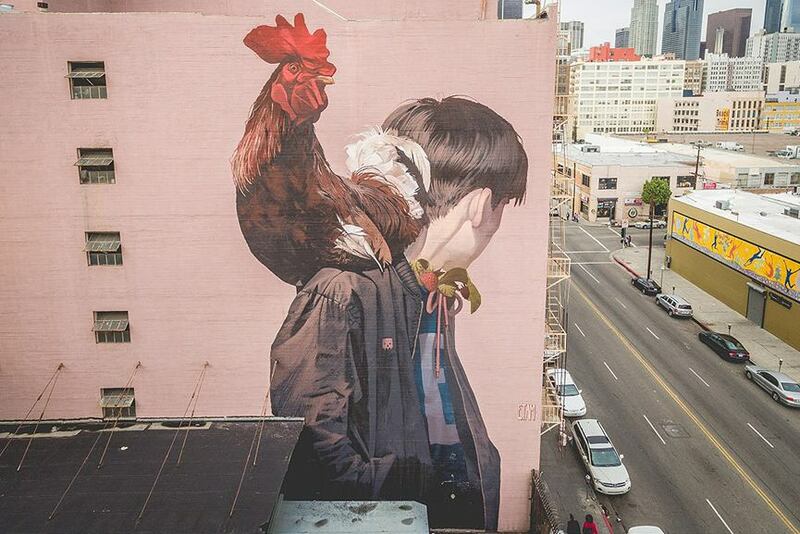 The new year keeps closing in on us, but before we leave 2015 behind, it is time to revise the best works of street art from the month of December. Once again, walls of the streets worldwide were adorned with interesting and awesome artwork by some of the most prominent names in the business. Some artists stayed true to their signature styles and techniques, while others dared to experiment a little bit and step out of their comfort zone. It is our Instagram followers who made the votes and brought these 10 pieces to the top of the list for December. Join our community and share your opinion as we welcome 2016 in excitement for the new magnificent pieces of art it shall bring. 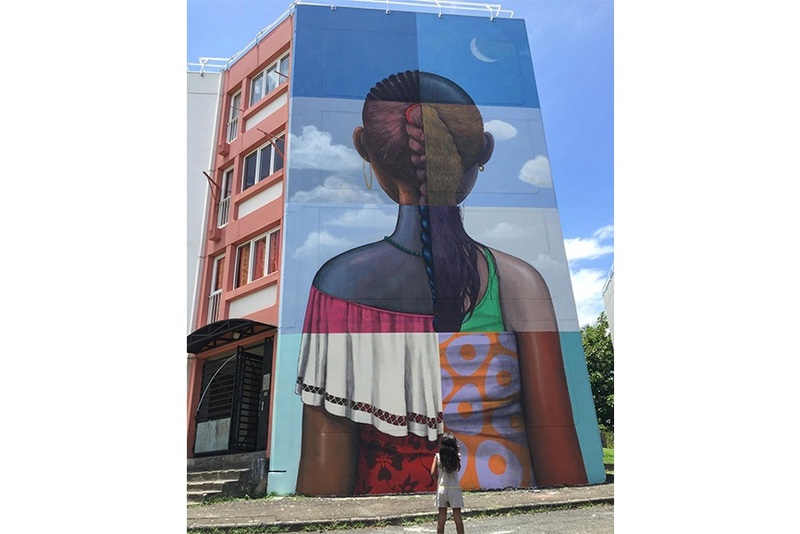 Seth Globepainter did quite an interesting piece in Reunion Island. Continuing his mission to cover the world with his colorful street art, hence the self-given nickname “Globepainter,” the French artist created this large-scale mural from seemingly 8 different pieces. The girl in the mural called Creole has her back turned to the viewer, and her clothing, skin and hairstyle seem to be compiled out of several different personas, perhaps representing the universal identity we all share. 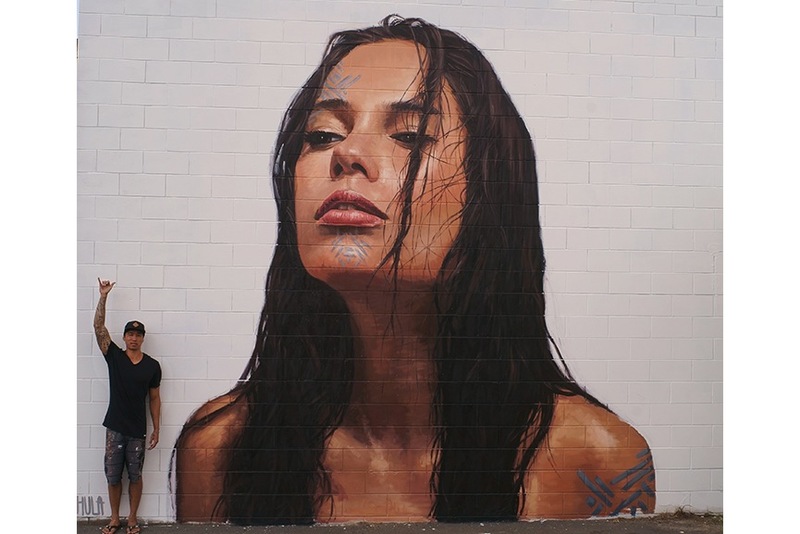 The inaugural Street Prints Mauao Festival in Mount Maunganui, New Zealand, featured many prominent names from street art, amongst them – Fin DAC. The Irish artist deviated slightly from his usual Asian-themed work, this time he employed the local culture to produce a Maori-inspired piece entitled Taaniko. 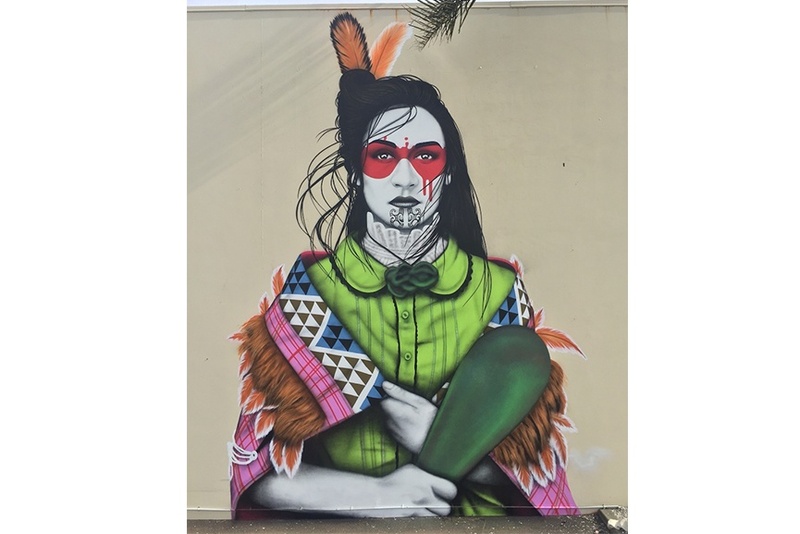 Inspired by a local model, Fin DAC spent 4 days working on this beautiful mural which was meant to depict the strength of a woman, embroidered with sadness of the loss of culture/heritage of the Maori people and culture. 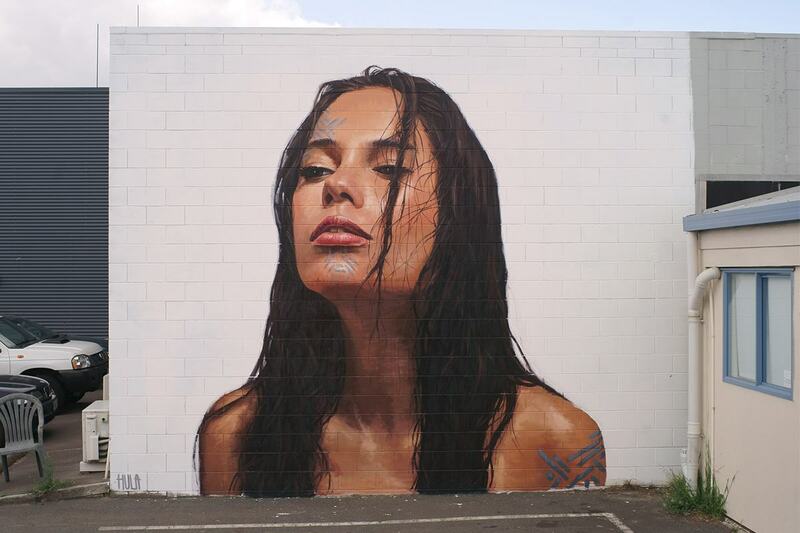 Another piece which was made as part of the New Zealand’s new festival is entitled Huli, and it was created by Hula, aka Sean Yoro. Another hyper-realistic image of a striking female portrait done in Hula’s signature style. 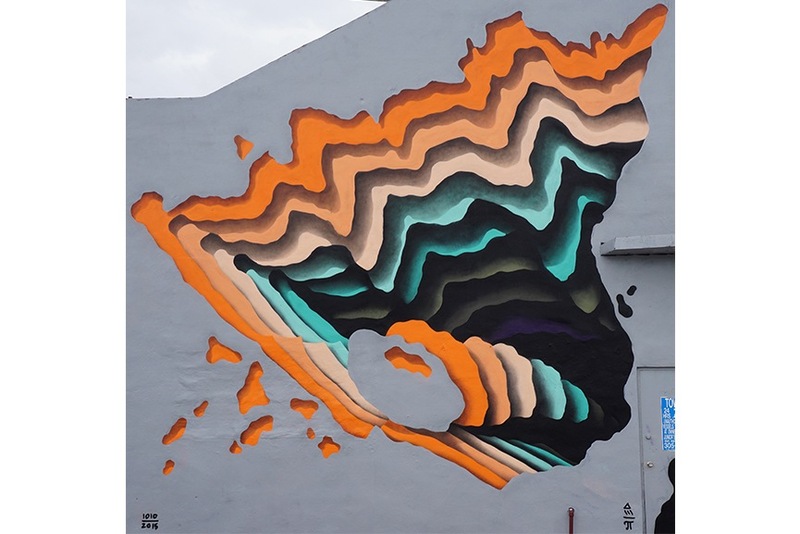 Famous for his ability to merge his backgrounds from both street art and fine art, Hula creates astonishing works which are a joy to gaze upon. And this particular piece was certainly one of the finest additions to the Street Prints Art Festival in Mount Maunganui, New Zealand. 65 years after the longest occupation by the workers of a factory in Italian history, around 40 street artists and writers gathered to produce their work and celebrate this historical and spontaneous event. Created at Officine Meccaniche Reggiane in Italy, NemO’s used a double-wall corner to produce this spectacular mural in his signature style. 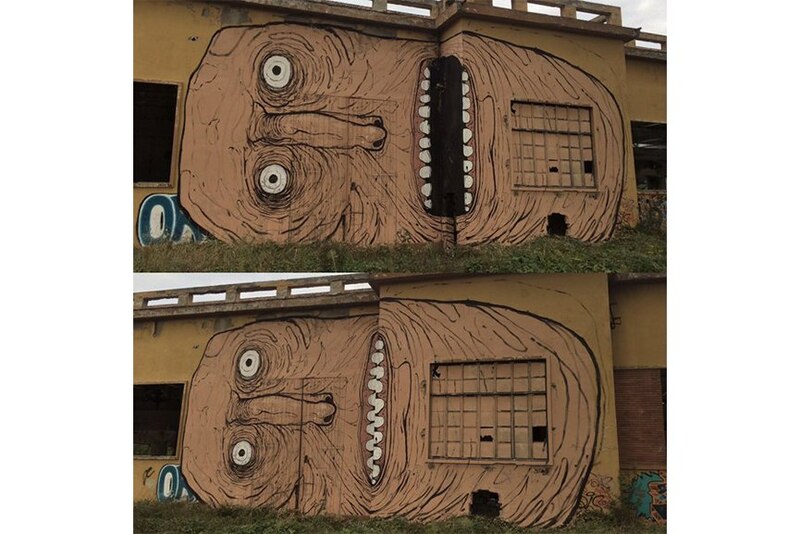 As the point of view changes, so does the mural acquire a different effect, in relation to the change of perspective the design comes to life and the mouth of the character seem to open and close. 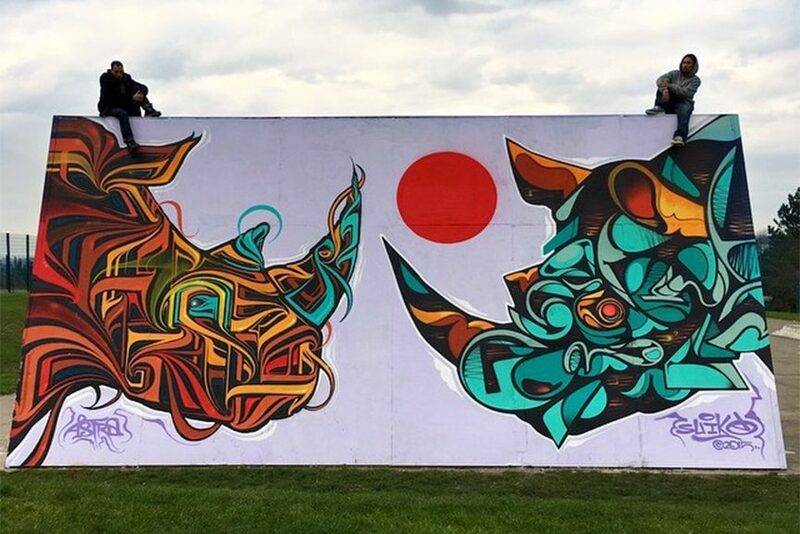 A live painting event was organized by Mana Contemporary in collaboration with the Bushwick collective from Brooklyn, NY. 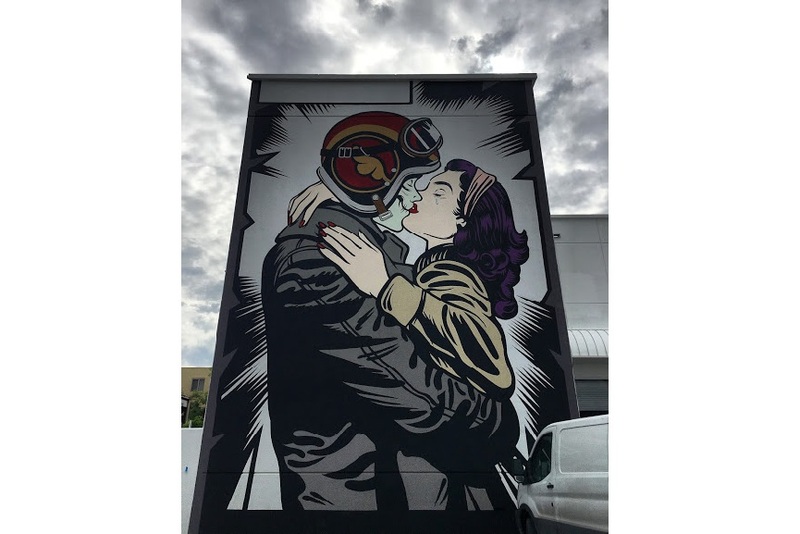 The UK artist D*Face contributed to this event with an astonishing mural made in his signature style which blends comic book imagery with pop art influences. As a recurring motif in his work, a zombie-like creature is portrayed with a beautiful girl as they are captured in a moment of a passionate kiss. The artist fittingly dubbed his style as aPOPcalyptic, and this addition to his oeuvre is one of the best depictions of the word. Kazuhiro Tsuji’s hyperrealistic technique, acquired from his background in the film industry, renders portraits of profound sense of soul and realism. Granted, this artwork doesn’t really fit in the street art tag, but it made the list as one of the most liked posts on Instagram. 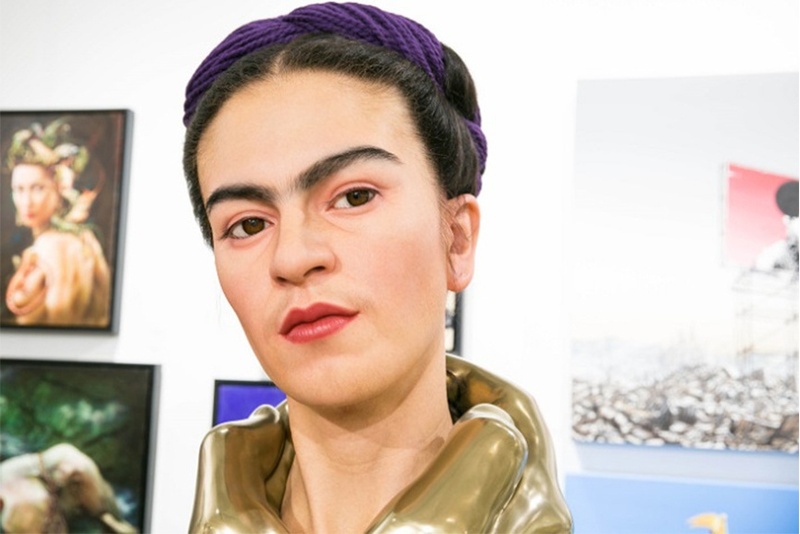 One of Kazuhiro’s latest subjects was a portrait of Mexico’s famous Frida Kahlo. The Japanese artist truly managed to capture the emotional beauty of Frida and give her memory justice through this amazing sculpture. Tsuji used a combination of resin, platinum silicone and other materials with a special technique that he once practiced as a special effects makeup artist. The hyperrealistic rendition turned out shockingly uncanny and life-like. Another portal-like illusion that seems to be sucking the viewer in was made by 1010 in Wynwood, Miami. 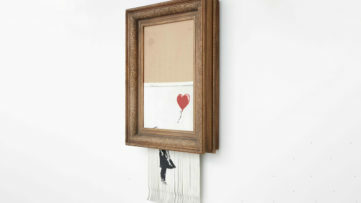 The free-hand painting is done in the signature style of the Hamburg-based contemporary artist. The latest addition to 1010’s compilation of three dimensional shapes was made during Miami Art Week. This particular piece features layered shapes that seem to be coming out of the mysterious hole, or perhaps going deeper inside, depending on your perspective. Either way, optical illusions of “Ten-Ten” remain baffling to the viewer, as they evoke a sensation of depth and 3-D space on a 2-D surface. 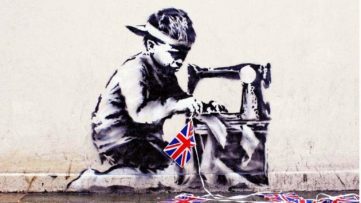 As per usual, any work by Banksy is surrounded by at least some amount of controversy and intrigue. 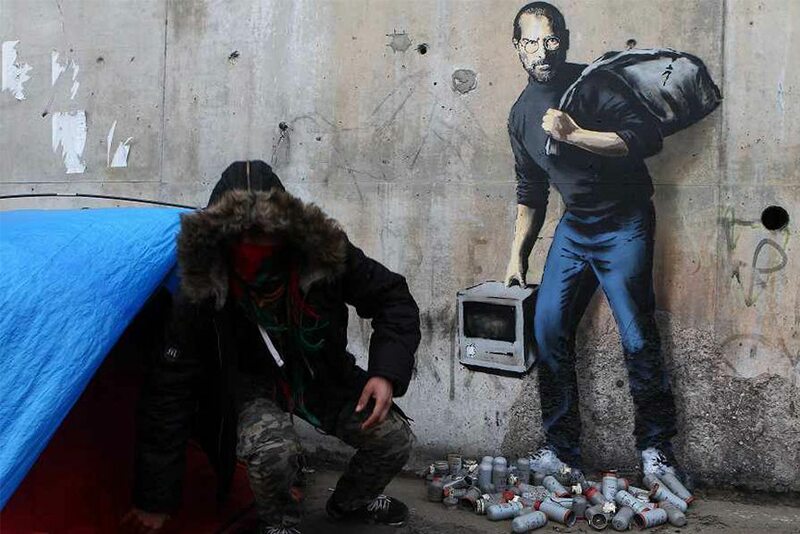 Sprayed on a wall in the Calais refugee camp, Steve Jobs by Banksy refers to Jobs’s background as the son of a Syrian migrant who came to America after WWII. The piece caused many debates and once again raised awareness of the dire situation of the migrants, which was probably the artist’s intention to begin with. Since it is a Banksy’s piece after all, some of the refugees even tried charging people to see the latest artwork of the elusive creator. 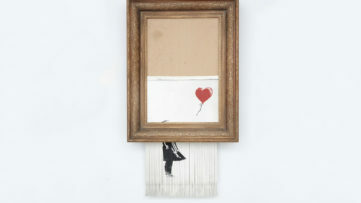 Even the authorities recognized the significance of the murals made by Banksy in the “Jungle”, and decided to protect and preserve his artwork.